A polar scientist, a robotic suit designer and an eye specialist who wants to save millions of people from going blind are among 10 innovators from around the world who have won Rolex Awards in the 40th anniversary year of the programme. Other winners have projects as diverse as technology to stop hunger and conservation initiatives to save species and habitats. The 10 Laureates and Young Laureates will be recognized tonight at a public awards ceremony in Los Angeles. The Rolex Awards are an international philanthropic programme that supports new and ongoing projects by individuals taking on major challenges to benefit mankind. It has served as a benchmark for corporate philanthropy the world over for four decades. Hundreds of luminaries, leading scientists, environmentalists and business people from Los Angeles and abroad will gather this evening at the Dolby Theatre, a Hollywood landmark that is renowned as home of the Academy Awards, to celebrate the spirit of enterprise manifested by the winners chosen in this commemorative year. The 10 winners of 2016 join the 130 Laureates who have gone before them in the 40 years since the Awards’ launch in 1976 when the programme was created to observe the half-century celebration of the iconic Rolex Oyster chronometer, the world’s first waterproof wristwatch. “We are celebrating a very significant occasion in the history of the Awards and in the history of Rolex,” said Rebecca Irvin, Head of Philanthropy at Rolex. “Forty years ago the company initiated the Rolex Awards to commemorate the 50th anniversary of the Oyster in a manner that reflected the spirit of enterprise on which the company was founded. The six men and four women were chosen by an international Jury of 12 eminent exper ts who selected them af ter meeting with the finalists who had been shortlisted from among 2,322 applicants representing 144 nationalities. Each Laureate receives 100,000 Swiss francs (US$104,000) and each Young Laureate 50,000 Swiss francs ($52,000) to advance their project; all receive a Rolex chronometer and worldwide publicity. Andrew BASTAWROUS, 36, United Kingdom – is an ophthalmologist whose team’s smartphone-based por table eye examination system, Peek Vision, is radically changing eye care in sub-Saharan Africa and other resource-poor set tings. Working in partnerships, trained lay people such as teachers or community volunteers can screen for vision problems, blindness and other eye diseases, enabling accurate diagnosis and treatment. Bastawrous and his team will set up a centre of excellence for Peek training and learning in Kitale, Kenya. Kerstin FORSBERG, 32, Peru – is a biologist protecting giant manta rays by helping fishermen pursue ecotourism as an alternative income source and training them alongside ecotourists to collect data on the distribution and abundance of this species. Forsberg will work with local communities to raise awareness and appreciation of giant mantas through outreach programmes that creatively combine the use of science and education. Vreni HÄUSSERMANN, 46, Chile/Germany – is exploring Chilean Patagonia’s fjords to document the unknown and unique life at the bottom of the sea at three remote areas by combining exploration and science in an attempt to create support for conservation through public outreach. She is also raising awareness about the damaging effects of current human activities on marine ecosystems to engage the public and decision-makers in setting up a science-based network of marine protected areas. Conor WALSH, 35, Ireland – is a mechanical and biomedical engineer, based at Harvard University in the US, who is tackling the mobility problems of stroke sufferers and others by developing a soft robotic suit that can be worn under clothes and will enable physically impaired people to walk without assistance. Expected to be ready in about three years, after clinical trials and regulatory approval, his “exosuit” will analyse and gradually train muscles, limbs and joints back into healthy patterns of movement. Sonam WANGCHUK, 50, India – is a Ladakhi engineer who is solving the problem of a lack of water for agriculture in the desert landscapes of the western Himalayas by building “ice stupas”. Named after Buddhist monuments, these conical ice mounds behave like mini artificial glaciers, slowly releasing water in the growing season. He intends to build up to 20 ice stupas, each 30 metres high and capable of supplying millions of litres of water. A long-term aim is to build an alternative university and engage youth in the environment. 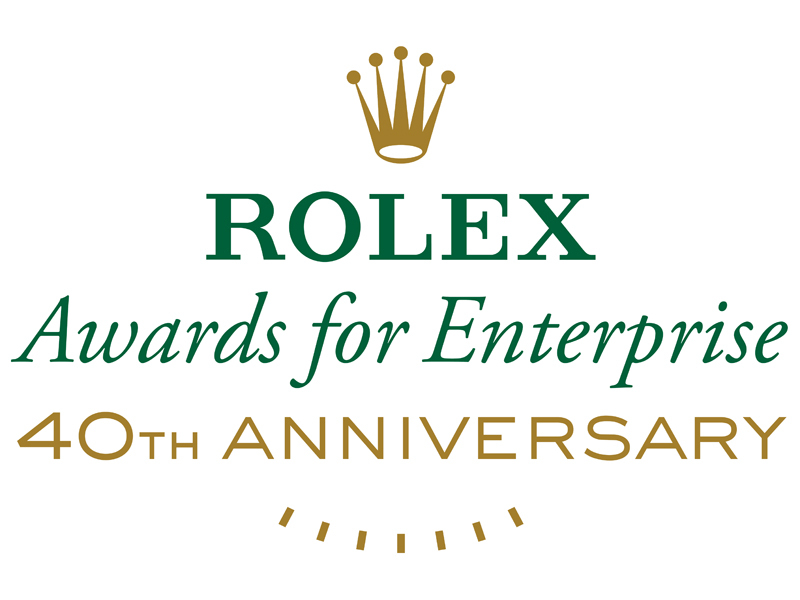 In light of the growing number of achievers under the age of 30 who are tackling today’s challenges with fervour, Rolex began a Young Laureates segment of the Enterprise Awards programme in 2010 to encourage younger pioneers at a critical stage of their careers and help them bring innovative ideas to fruition. Joseph COOK, 29, United Kingdom – is a pioneer in the field of glacial microbiology who, through his Ice Alive mission, is exploring polar ice microbes in the vast “frozen rainforest” of the Greenland ice sheet and communicating how these microbes influence climate, nutrient and carbon cycles, and other aspects of our world and its systems. Oscar EKPONIMO, 30, Nigeria – is addressing the problems of food poverty through Chowberry, a cloud-based application that automates the monitoring of food products approaching the end of shelf-life and generates notifications to food retailers, allowing them to offer discounts to charities, and ultimately helping to alleviate hunger in the country. Christine KEUNG, 24, United States – emigrated to the US at the age of four and is using her education as a force for good by empowering women in north- western China, where her family originated, to work with doctors and industry to reduce water and soil pollution and act as environmental stewards and agents of change. Junto OHKI, 29, Japan – is improving communication among hearing-impaired people worldwide by expanding a crowdsourced, online sign-language database dictionary called SLinto, which will bridge the gap between the 126 extant sign languages and become a global platform for all existing and new signs. Sarah TOUMI, 29, France/ Tunisia – is spearheading a grass-roots initiative, Acacias for All, in Tunisia, to fight the country’s desertification caused by climate change and reduce poverty among farmers through reforestation and crops more suited to a lower rainfall. She also runs a non-governmental organization to help women and youth realize their potential. The 2016 winners become part of the community of the Rolex Laureates and Associate Laureates who have helped to reshape the world in the 40 years since the Awards were created. Tonight’s 40th anniversary celebration in Los Angeles acknowledges the catalytic impact that they have made on their communities and beyond. Philanthropy and corporate social responsibility have been an integral part of Rolex’s corporate culture since its beginnings. Suppor ting the greater good and individual achievement is fundamental to the company’s ethos. The Rolex Awards for Enterprise and its sister programme, the Rolex Mentor and Protégé Arts Initiative, comprise the two major international philanthropic programmes created and run by the company. The Arts Initiative brings together emerging artists with masters in architecture, dance, film, literature, music, theatre and the visual arts for a year of intensive collaboration. The aim is to help ensure that artistic excellence is passed on to the next generation. Both programmes foster innovation and advance the work of those who exemplify the vision, originality and excellence that define Rolex. Laureate Andrew Bastawrous, CEO of Peek, in Kitale, Kenya, where he plans to set up a centre of excellence. Laureate Andrew Bastawrous, CEO of Peek, with Kenyan colleagues in Kitale Hospital. The Peek retina device is attached to the back of a smartphone. A Kenyan woman has her sight tested by Peek after an eye operation. Laureate Andrew Bastawrous uses the Peek device to examine a Kenyan woman suffering from cataracts. Laureate Andrew Bastawrous uses the Peek device to examine a Kenyan woman suffering from blindness. Andrew Bastawrous (centre) uses Peek to check a Kenyan man’s sight (right). In a remote Kenyan village Isaac Busieney’s retina is examined using Peek’s mobile technology. An image of a retina on Peek’s mobile device during eye tests at Lurare school in Kenya. Kenyan school teachers who have tested children’s sight using Peek’s mobile devices. Peek staffer Cosmas Bunywera (centre) with people whose sight he has tested using Peek devices. Andrew Bastawrous and colleagues at the site where Peek’s centre of excellence will be built. Laureate Kerstin Forsberg in Zorritos, Peru. Laureate Kerstin Forsberg (centre) and her team in their office in Zorritos, Peru. Fishing boats set out for their early morning catch. At Puerto Pizarro fishing harbour, Kerstin Forsberg (centre) talks to fishermen about manta ray conservation. Divers in Forsberg’s team search for manta rays. The manta ray’s wingspan can reach up to 7 metres and its weight two tonnes. Laureate Kerstin Forsberg (right) and a colleague prepare to dive on a manta ray search. Community members in Zorritos, Peru, create a mural to raise awareness of manta ray protection. Laureate Kerstin Forsberg and school children play games raising awareness of manta ray protection. Children take part in a street parade to raise awareness of manta rays. Kerstin Forsberg announces winners of a best manta costume competition at the street parade. Kerstin Forsberg takes part in a street parade to raise awareness of manta ray protection. Vreni Häussermann, marine biologist and 2016 Laureate. Huinay Scientific Field Station is located in an isolated area of Chile’s Patagonian fjords. Vreni Häussermann on an expedition to collect marine life from the fjord. Vreni Häussermann with a remotely operated vehicle that she uses to document and sample deep-water marine life. The remotely operated vehicle is placed in the water, ready for exploration. Patagonia’s fjords, the focus of Vreni Häussermann’s research, are a biodiversity hotspot. Sea anemones (Actinostola chilensis) on the Patagonian seabed. The cold-water coral Desmophyllum dianthus is one of many marine creatures researched by Vreni Häussermann. Exploring the diverse marine life of Patagonia’s fjords. Vreni Häussermann collects a tiny starfish (Solaster regularis) for analysis at Huinay Scientific Field Station. Vreni Häussermann and her team analyse marine life in a dry laboratory. Vreni Häussermann, just back from a dive, in the wet laboratory at Huinay Scientific Field Station. Conor Walsh at Harvard University. The exosuit displayed on a mannequin. The exosuit is adjusted on a mannequin. The engine that powers the exosuit developed by Laureate Conor Walsh and his team. The exosuit is tested in a laboratory. The results of laboratory tests on the exosuit are recorded. The components of an exosuit ready for assembly on a mannequin. Laboratory tests of the exosuit at the Wyss Institute for Biologically Inspired Engineering, Harvard University. Laureate Conor Walsh (right) and his team at the Wyss Institute, Harvard University. Laureate Conor Walsh (left) and a colleague assemble an exosuit on a mannequin. In late spring, the melting ice stupa provides water for crops. Laureate Sonam Wangchuk uses natural materials like bushes to start ice formation. Laureate Sonam Wangchuk at 4,000 m in Ladakh, an area that suffers water shortages. A tree plantation receiving water from ice stupas. Sonam Wangchuk and a colleague create a drip irrigation network to use water from ice stupas. A traditional stone stupa in the Phyang valley in Ladakh. Sonam Wangchuk shows building plans to monks and colleagues at the planned site for a university. An experiment in desert tree plantation at the SECMOL Alternative School. An irrigated valley in Lamaruyu, Ladakh, often called the moonland due to its barrenness. The University of Sheffield, United Kingdom, where Young Laureate Joseph Cook is a research scientist. Joseph Cook, glacier microbiologist and 2016 Young Laureate. Young Laureate Joseph Cook extracting bacteria and minerals from a water sample. Arctic samples from Joseph Cook’s research seen through a microscope. Young Laureate Joseph Cook on a Greenland research expedition. Research equipment in Joseph Cook’s office at the University of Sheffield. Joseph Cook collects samples from the Greenland ice sheet to be analysed in his lab. An ice hole in Greenland, showing bacteria around the circular hole. The region in Greenland where Cook is conducting his project. Oscar Ekponimo, software engineer, entrepreneur and Rolex Young Laureate, in his office. Young Laureate Oscar Ekponimo with colleagues generating ideas for Chowberry in his office. Young Laureate Oscar Ekponimo uses Chowberry on a tablet to register supermarket goods. Young Laureate Oscar Ekponimo outside one of the retailers in Abuja, Nigeria, which uses Chowberry. Supermarket manager Abduljeleel Salawudeen (right) and Oscar Ekponimo select items to list in the Chowberry app. Chowberry colleagues using the application to record items in a supermarket. Oscar Ekponimo (centre) and supermarket manager Abduljeleel Salawudeen (left) select items for Chowberry. Oscar Ekponimo (right) visits Lea Wuye Primary, a Nigerian school whose pupils do not have enough to eat. Young Laureate Christine Keung by a polluted river near Xiangjisi village, Xi’an, China. Christine Keung with 79 year-old Guo Aifang, one of many women participating in Keung’s project. Young Laureate Christine Keung plans a field trip with her colleagues in Xi’an, China. Christine Keung’s colleagues discuss village waste problems before undertaking research in the field. A villager wading through a river near Xiangjisi village, Xi’an, China. A sanitation worker in front of a street display illustrating disposal methods in Xiangjisi village, Xi’an, China. A water-quality monitor used by Keung and her colleagues, on the banks of a river near Yanan, China. Christine Keung and village doctor Ma Juncheng in his clinic near Yanan, China. Christine Keung (centre) and colleagues test water from a well near Yanan, China. Christine Keung (left) and colleagues examine rubbish dumped beside a river near Yanan, China. Young Laureate Junto Ohki in his office. Junto Ohki, Young Laureate and President of ShuR, at his office in Tokyo. Young Laureate Junto Ohki displays signs on a computer tablet. Junto Ohki demonstrates sign language. An interpreter at work using video chat at ShuR’s office in Tokyo. Sign language dictionaries in English, Korean, Chinese and Japanese. Sign language interpretation using SLinto on a computer screen. SLinto users select fingers and positions to form words. Deaf people can communicate via sign languages that use both hand movements and facial expressions. Deaf people can communicate via sign language that uses both hand movements and facial expressions. Young Laureate Junto Ohki demonstrates how SLinto works. Young Laureate Junto Ohki with a sign language interpreter at the ShuR office in Tokyo. Sarah Toumi, Young Laureate and founder of Acacias for All, with moringa plants. Young Laureate Sarah Toumi explores the potential for growing acacia trees at Menzel Habib in Tunisia. Young Laureate Sarah Toumi under a 20 year-old acacia tree in Tunisia. A young acacia tree at Menzel Habib in Tunisia. The leaves and thorns of an acacia tree in Bou-Hedma National Park, Tunisia. A fully grown acacia tree in Bou- Hedma National Park, Tunisia. The seeds of an acacia tree in Bou- Hedma National Park, Tunisia. Young Laureate Sarah Toumi (standing) and colleagues planting acacia seedlings in Bir Salah, Tunisia. Acacia seedlings at Sarah Toumi’s family property in Bir Salah, Tunisia. Sarah Toumi (left) planting seedlings. Acacia seedlings planted at Bir Salah, Tunisia. Acacia seedlings benefit from irrigation at Bir Salah, Tunisia.